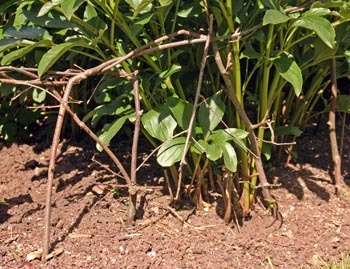 Pea-staking is a rustic method of staking plants. Many perennials, especially tall, multi-stemmed ones, benefit from staking. Staking is most effective when the supports are placed when the plants are still small, long before they begin to flop over. Staking doesn’t have to be unattractive, and if done correctly, is not intrusive. 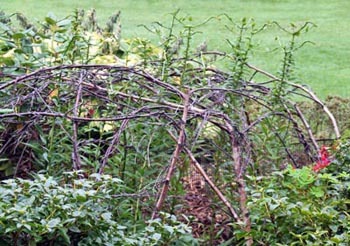 Properly staked plants have no visible means of support – the foliage grows up to hide the materials used for support. 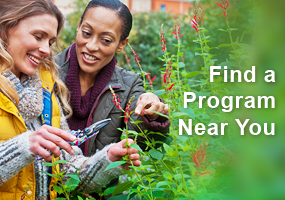 When placed properly, pea-stakes are barely visible once the plants reach their ultimate height. y, it is one of the least obtrusive and most natural staking methods and should be considered for many small to medium-size perennials, such as shorter asters, baby’s breath (Gypsophila), bee balm (Monarda) bush clematis, coreopsis, campanula, hardy geraniums, phlox and yarrow. This method is also useful for floppy or rambling annuals, such as sweet peas. These rustic supports are most often used for plants that don’t grow taller than about 2 feet, but can also be successfully used for taller plants where the stakes only need to provide support up to about half way up the plant. This simple, no-cost support method is more natural-looking than bamboo or metal stakes, and requires no tying. And it also recycles prunings from your own garden. Pea-stakes hold up a peony at Kew Gardens, London. Twiggy branches, preferably with a three dimensional branching habit, are best. 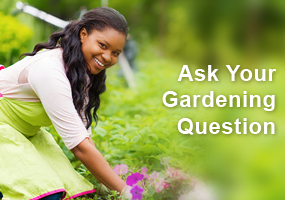 Use dead wood or prunings that are stiff, but not so brittle that moderate pressure breaks them. The branches need to be able to hold up the plant at mature size when it is being buffeted by wind. Any type of prunings with a lot of finely textured twigs can be used. Birch, some types of oak, American hazelnut (Corylus americana), forsythia, viburnum and dogwood work well. 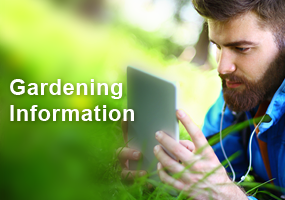 Avoid using recently cut, live branches as some types may root when used in this manner. Position the pea stakes around the perimeter of the plant, pushing the stem end into the ground, angling them slightly inward toward the middle of the plant. This is best done early in the spring before the plants are 6” tall. 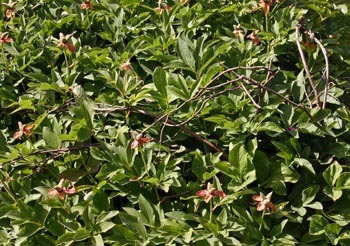 The tops of the twigs should be about 6” shorter than the perennial’s mature height so that they will eventually be covered up. The plants will grow up through the network of twigs and their foliage will soon hide the support structure. Or the twigs can be snapped over at the appropriate height and interwoven to provide a stronger framework if needed. A gardener places twigs for staking among carnations in the garden at Great Dixter, East Sussex, England. You may have to partially break the twigs, but make sure they remain attached to the main part. If there are any unsightly twigs sticking out, you can just cut them off. In heavy soil you may wish to sharpen the ends of the pea stakes by cutting off the pruned limbs at an angle to make them easier to penetrate into the soil. Place a few pea stakes in the middle of groupings of plants that need staking, as well as around the perimeter. Pea stakes can also be used to assist climbing plants onto their trellis. The sticks will eventually break down over the course of the season, and you can just clean them up in the fall when you remove the perennial’s foliage and stalks, and everything can go right into the compost bin.